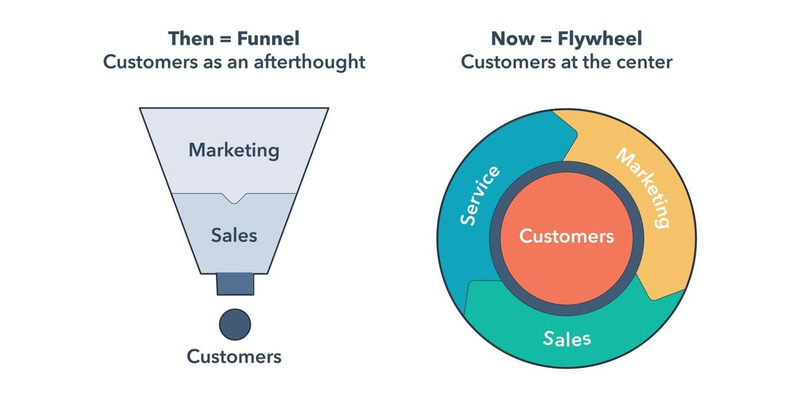 HubSpot has introduced an evolution of the Sales Funnel dubbed The Flywheel. At the center is the customer surrounded by Marketing, Sales and Customer Services. The Flywheel is an interesting concept and one which should get some significant adoption. We feel the Flywheel works best for large companies with an established or very large customer base. Brands like Monster Energy, Apple, and Dunkin’ Donuts are in a position to delight customers in the way the Flywheel is set up. For most companies, especially small companies still building a customer base, the traditional funnel will probably keep serving its purpose. During the session “How to Get Started with Artificial Intelligence in Inbound Marketing”, Paul Roetzer CEO of Marketing Artificial Intelligence Institute reassured the marketing world that their jobs were not in jeopardy any time soon. The room let out a chorus of chuckles and sighs of relief. Paul put AI into perspective. His feeling is AI is still a long way from being perfected and only a handful of companies are doing real AI (Google, Facebook, IBM). Most others are deploying bots – simple, robotic, and not very conversational communication. Ryan Deiss from Digital Marketers had one of the best quotes of Inbound 2018 when he said, “Bots are for filtering, not for closing.” His take on using bots and other digital channels to communicate with potential customers is refreshing – there is no B2B or B2C, only Human to Human (H2H). We agree with his recommendation that bots are for collecting just enough info from a human to get them connected with the right human in your company to help solve their problem. Any company that operates as if any bot is for closing business will continue to be frustrated and let down. We’ve been pushing for workflows based on deal properties for over a year, and this year Hubspot has delivered, rolling out Deal Properties. Especially with internal or operational communications, it’s vital to have alert workflows based on things like deal stages, deal amounts, and deal close date. It’s nice to finally have this kind of flexibility. Bravo, HubSpot. It’s not a secret video is now the king of content. The secret has been just how to tackle video content for each business. During the session “7 Video Tactics That Enables Sales to Win More Deals”, Inbound evangelist George Thomas said the key is creating “one to one videos, not one to many videos.” And there never been an easier way to make personalized videos. We are fans of platforms like Screencast-o-Matic and our sales team uses them to email conversational and personalized videos to potential clients. George suggested, and we agree that explainer videos, episodic videos, and quick tips or tricks are good places to start. Other George Thomas gems include, “It’s not what video can do for you, it’s what can you do with video”. And a video is still perceived to be hard and expensive to produce,but with platforms making it easy to produce, it’s easier than ever to start “wowing” your clients today. In the session “How a Year of SEO Split Testing Changed How I Thought SEO Worked”, Dominic Woodman of Distilled confirmed SEO split testing is hard. Dominic spent the better part of a year attempting to make sense of how SEO changes affected conversions, sale, and revenue. His brilliant conclusion was – its hard, it takes time, the same changes for different businesses are not consistent, generally, your hypothesis will be wrong, it’s maddening at times, it will give you incredible insight, and it’s always worth it. Everyone and their families want a website to convert better. After all, that’s where the magic happens. Bradley Friedman of Lucky Orange offered some interesting places to look for better conversions during his session called “5 (Very) Actionable Ways to Improve Website Conversions Today”. He suggested moving your calls-to-action (CTAs) down lower on pages because most visitors need some time to get familiar with a business or product before engaging. Bradley also suggested, and we advise our clients of this as well, to look at web forms for problems areas. Test shorter or longer forms to see if these changes get your business more qualified leads. We often refer to content creation as the “Content Monster”. Generally, it takes commitment to go from thinking about great content pieces to launching great content pieces. Creating content based on the questions your sales team regularly gets is an excellent place to start. When we conduct an initial content meeting with clients, we zero in on the sales team to discover these questions. Create content to match the intent is another great tip. Are you offering up a piece of content that gets your customer closer to taking the next step? Maybe it’s time to rethink asking for a newsletter subscription and ask a website visitor if they would like the top 10 questions most people have before purchasing a residential pool? Inbound 2018 was another great success, and all those nuggets that we learned we bring back to use with our customer. Stay tuned for our future post where we go into more detail on these and other subjects here at Colling Media.